Webinar | First Scribbler! First Writer! First Author! Classrooms supporting students with significant delays in writing ability and those who barely make a mark on a page have been getting on the path to writing through the researched-based First Author Writing Curriculum. Whether starting in Elementary, Middle, or High School with students who are First Writers, this curriculum provides lessons to teach why we write, develops a desire for writing, and can help educators create a community of authors in their classrooms! Imagine returning from a doctor’s visit. The prognosis, acid reflux. The doctor gave you a prescription to Nexium. You’re feeling good that you finally found a fix; the maker even advertises it as the “Healing Purple Pill,” and besides, it’s a popular drug with sales over $6 billion per year. You consult Google to confirm the good news. What you learn is shocking. Besides startling side-effects, you find out that Nexium only works for 1 in 25 people (Schork, 2015). The drug was likely approved on the basis that it worked for some people better than sugar pills (placebo). This was based on analyzing a group average—it doesn’t tell you whether the specific treatment will work for you or any particular individual, but that’s the one thing you need to know! You can ask a similar question for educational programs, like intervention. The research shows that, on average across a group, it works. Around two in three students receiving intervention get above the lower 30th percentile (Torgesen, 2000)–a much better percentage than most pharmaceutical drugs. But until the intervention is underway, it’s difficult to know with accuracy which students will respond. It’s called precision (or personalized) medicine. The idea behind precision medicine is logical—identify the traits of individuals that will determine a drug’s effectiveness. Then doctors could better understand what should be prescribed. Intervention could learn from precision medicine—better understanding the individual traits that lead to better educational outcomes. It goes beyond merely knowing a student’s reading scores (that’s similar to knowing that you have heartburn). You want to know about the destination—where exactly a student can get to with the intervention. Let’s examine the 30% of students in reading intervention who are still stuck in that lowest group—the ones who fail to respond to intervention. Despite receiving research-based reading interventions, one of every three students remain in the lowest 30th percentile. Through intervention, if these students are not getting back to grade level reading, they wouldn’t be able participate and comprehend the general education curriculum. What then? You’d want some precision diagnostics to know what they need. This is not the type of prediction based on an average of student outcomes. It’s a precision diagnostic where you and your students find out exactly the text levels they can comprehend with an accommodation. It’s often transformative for students. 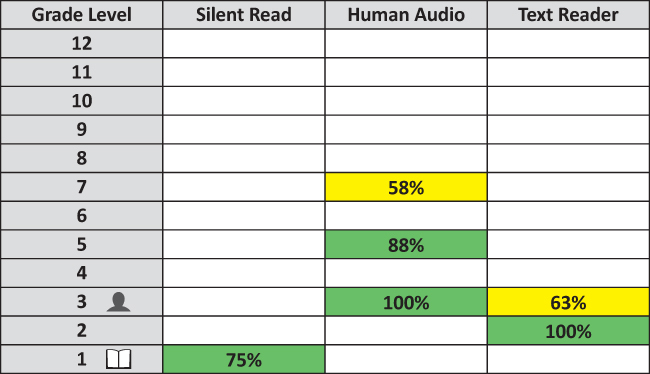 Many students learn that they can comprehend grade-level content while some students find out that they can read well above grade level by listening to text read aloud. Kayle is one of the students who was transformed when her teacher brought in uPAR in 3rd grade. Despite Kayle reading at a beginning level (Lexile BR), she learned that through listening to passages read aloud, she could comprehend text above grade level. And it was exactly what she needed. Kayle would still receive specialized reading instruction, but now she had a way to read independently and handle grade-level passages while her reading skills improved. Now extrapolate Kayle’s transformation across an entire school, district, or state. How many students could say that what they learned in one class period would change their lives? The future isn’t in averages, it’s in precision. Last year, we shared the story of Kayle—the elementary school triplet who was transformed after her teacher administered uPAR and gave her Snap&Read Universal. We drove down to Indian Creek School in Indiana to meet up Kayle, her mom, and Shellie Parr (her 3rd grade teacher). We captured her powerful story in video. See how data-driven decision-making and accommodations are having a huge impact. Now Kayle is keeping up with her sisters, reading independently, and plans to fulfill her dreams to be a scientist! This has been a decade in the making—now we’re only a few months away from launching Readtopia™! It’s a comprehensive reading and learning curriculum for middle and high school students who take the alternate assessment. Watch a 3-min preview of Readtopia! 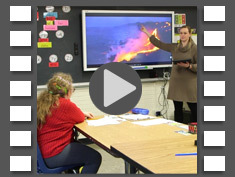 With over $5 million of materials at your fingertips including experiential video, leveled graphic novels, and informational text, you will take students further than they’ve ever been before. 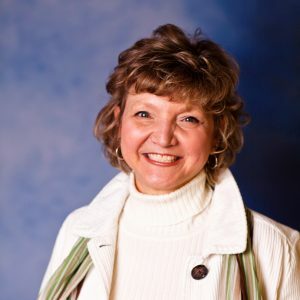 It’s a curriculum like you could only imagine, developed by the top names in literacy including Dr. Karen Erickson (DLM Alternate Assessment), and Dr. Caroline Musselwhite (AAC and literacy)! And it’s due out THIS school year. Sign up to get more info on Readtopia as we release it! Hear Gavin and his teachers tell happened next! And we did in 2016! We worked with you to give opportunities to students! Watch our 1-min retrospective on 2016. • Students wrote over 500 Million words with Co:Writer. • We met students who are on a new path because of our accessible tools! 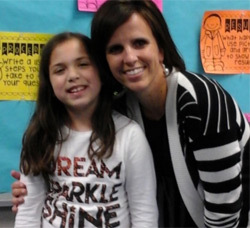 This is where the story of 3rd grade resource teacher Shellie Parr and her student Kayle begins. Interventions included special tutoring (a two-hour drive for Kayle’s mom, Mary) and having Kayle read more hoping that more reading would help her outgrow her reading difficulties. Kayle’s self-perception was that she wasn’t as smart as the other kids – that she couldn’t keep up. 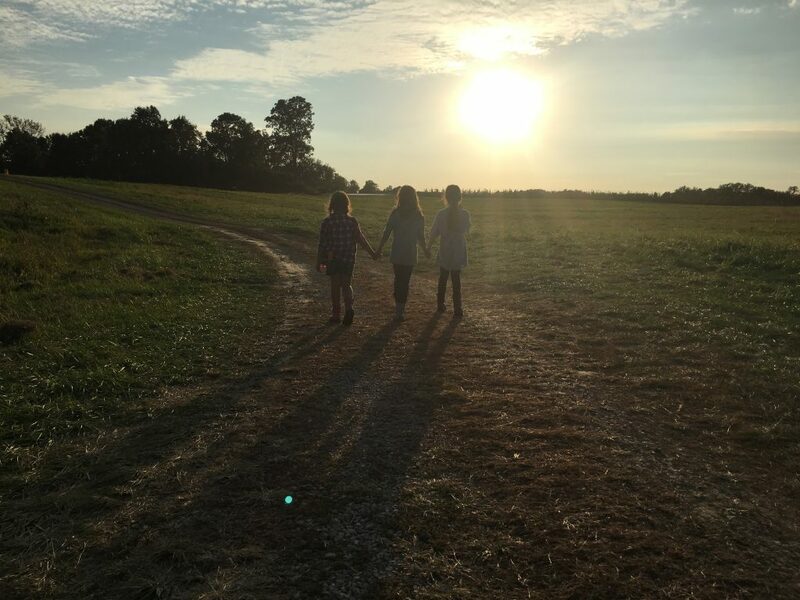 Being a triplet, it was especially difficult both emotionally and socially to lag behind her two sisters. Her mother Mary said, “Kayle was so nervous about being called on to read aloud in class that she came home most days with lips bitten.” Kayle needed something or someone to turn things around for her. She needed a change of perspective. 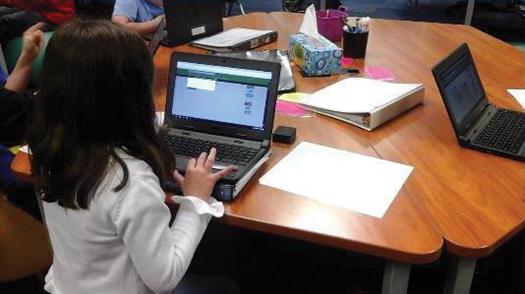 Fortunately for Kayle, her school, Indian Creek Elementary, was part of the PATINS Project outreach to use uPAR (Universal Protocol for Accommodations in Reading) to find out whether accommodations would benefit students who didn’t respond to intervention. 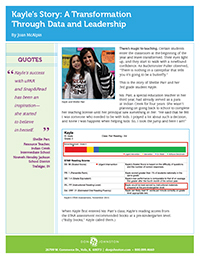 When Ms. Parr administered the uPAR assessment to her students, Kayle’s results shocked and delighted her. 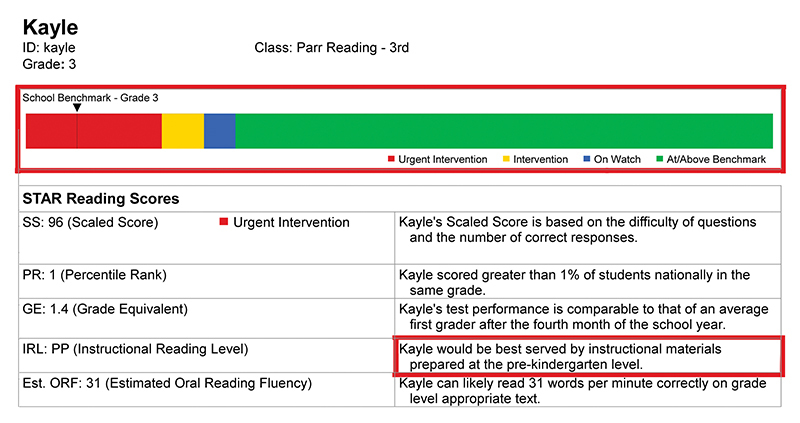 uPAR confirmed the STAR assessment findings that Kayle was reading independently at a 1st grade level. But, uPAR also showed that with a reading accommodation, Kayle could comprehend beyond grade level. Ms. Parr was surprised by the disparity. The STAR recommended instructional materials at a pre-kindergarten level while uPAR showed that Kayle could comprehend instructional materials beyond grade level. Armed with a new perspective, Ms. Parr shared the results with Kayle. For the first time, Kayle saw proof she could understand materials as well as her peers. A simple read-aloud accommodation could help her keep up. The next five months would amaze Ms. Parr, district leaders, Kayle’s parents, and Kayle herself. Using Snap&Read, Kayle accessed the general education curriculum unmodified. She didn’t need pre-kindergarten instructional materials. Instead of dreading reading, she became excited that technology could help her read like the other kids and even catch up to her sisters. This abrupt turn of events for Kayle was a revelation to her parents. Mary, as her father before her, experienced reading issues in school but never received the kinds of supports now available. Mary is thrilled that her daughter now has access to tools that help her read and learn. She sees a future for her daughter that includes college and a career. Despite Kayle’s access to grade-level curriculum and confidence about-face, some educators, parents, and general naysayers worry that accommodations are cheating. They worry that students will use them as a crutch and won’t be able to pull themselves up by their own bootstraps. After months of using Snap&Read, Kayle started reading. 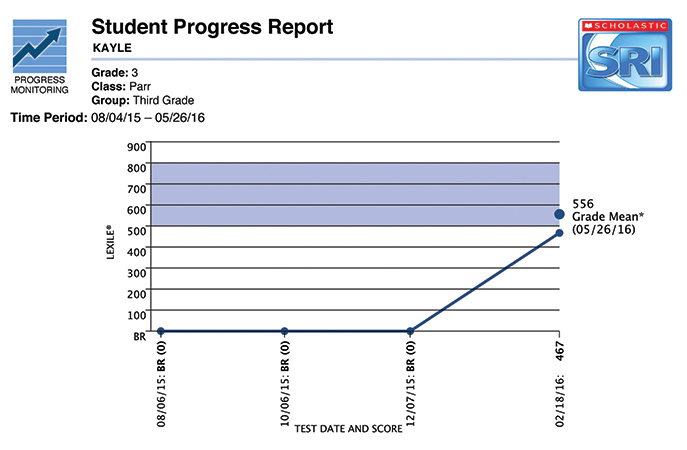 From November 2015 to April 2016, her Lexile scores jumped from BR (Beginning Reader) to 467 with her accommodation! Encouragingly, Kayle’s Lexile level even improved 0 to 271 without her accommodation. Using Snap&Read had remedial impact for Kayle! A message to the naysayer, the crutch did its job. The crutch encourages healing by taking the pressure off weak areas. In Kayle’s case, it’s exactly what she needed to heal her damaged self-confidence and encourage new growth. Kayle is not alone. Hundreds of thousands of students have been assessed with uPAR, and new students are following the same path as Kayle. Students who thought they weren’t as smart as the other kids are finding out that they just learn differently, and they can keep up with a simple reading accommodation. Kayle is feeling proud of herself in school now. She made the last two honor rolls. She’s glad to show other kids who have a hard time reading that accommodations can help them too. Kayle’s parents say now their daughter has big dreams of being like one of her heroes—her Uncle Justin. He is a college graduate and sells helicopters. She wants to go to college, major in drama, sing and become an actress. She knows reading and memorizing lines will be important. Kayle’s success with uPar and Snap&Read has been an inspiration. She started to believe in herself. She just needed a great teacher, a caring family, and some simple data from uPAR to help her see herself in a new light. 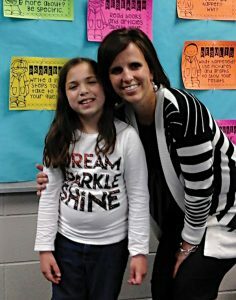 Far into the future, the 3rd grade may be the time Kayle reflects on most…thinking of the impact Ms. Parr had and how she turned it all around. Sometimes teaching is two parts passion and one part magic. Update, June 2017: Kayle and her triplet sister Epic teamed up this spring at the Indian Creek Intermediate School Science Fair. 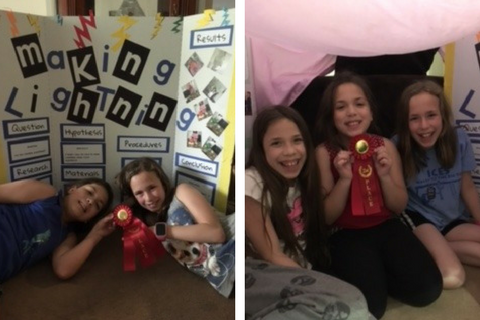 They took Second Place for their presentation, “Making Lightening”. Looks like Kayle’s plans to become a scientist are well underway!